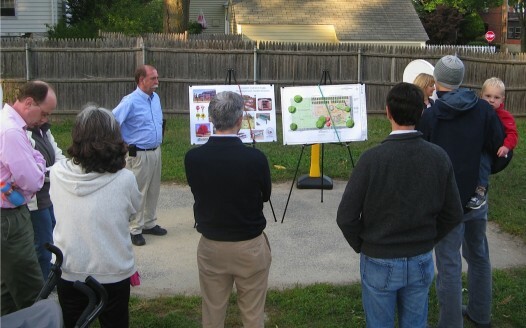 Robert F. McMahon, superintendent of the Department of Parks and Recreation, and Megan Gardner, a landscape architect with Gardner and Gerrish, set up easels with large-scale drawings of the proposed design. McMahon said the city “is not wedded to this plan,” but that there was sentiment that the park was not now well-suited to toddlers and was used mainly by older kids. He also cited neighborhood interest in community gardening, a concept that he supported in parks around the city. Gardner described how 40 individual garden plots of 4 feet by 8 feet would run along the northern edge of the park and how a wooden picket fence would separate the children from the garden. There would be a central walkway and storage space for tools and mulch. The parks superintendent said plots are organized by neighborhood rules, typically with one-year memberships at a fee of about $25 to cover overhead. McMahon said that with the right to garden comes certain responsibilities and that 40 plots was what his department felt comfortable that the area could support. He noted that community gardens all over the city have waiting lists of people who want to use them. 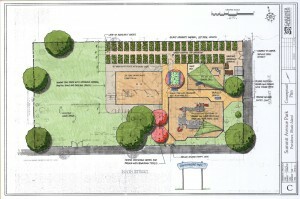 Landscape architect Gardner said the improved play area is “designed for kids low to the ground,” those two to five years old. Much of the current sand would be replaced with turf, but there would be a sandbox and a “shade sail” for the area exposed to the sun. She further said the design would “provide ADA handicapped facilities,” referring to the Americans with Disabilities Act. McMahon also said there would be raised beds for gardening by handicapped. Slides would not be metal, Gardner said, so kids wouldn’t get burned on sunny days. There would be a picnic area and a tricycle route that would be a “branch of the DMV here” with stop signs and parking spaces. She said the landscaping would be updated “based on your input” and incorporate small shade trees. He noted that the Summit Neighborhood Association had come to the city, requesting the development. However, some residents expressed concern that the garden area would detract from the amount of space available for kids to play in and that the “tot lot” is very crowded with users, especially on Saturday mornings. They questioned if other areas, such as Lippitt Park, had been considered for community gardens. Dean Weinberg, SNA president, pointed out that a survey by the organization found very vocal opposition to taking any space in Lippitt Park for gardening and said the current proposal came after those objections. Still, some of the people at the tot-lot meeting expressed reluctance to use any of the space for gardening and said a new survey should be done. McMahon responded that the meeting was the first in the community and wouldn’t be the last. He also voiced surprise at the level of opposition. He proposed another meeting, this one to be held some time in October, possibly a Saturday morning, at Summit Commons. I really love your post. I read your site pretty often and you’re always coming out with some amazing things. I shared this on my FB and my followers only adored it. Keep up the great work! Is there any update as to when the next meeting is planned? I would like an explanation of how the survey was done and who was surveyed as I did not receive anything and frequently use the park. The statement that the park is not being used by toddlers is completely uninformed. Has anyone actually sat in the park day to day and observed how it is being used? I am not opposed to community gardens but not at the expense of taking away green space from children. Why not an abandoned lot that could be turned into something useful?